X509 based authentication support via Secure Login Client(SLC). 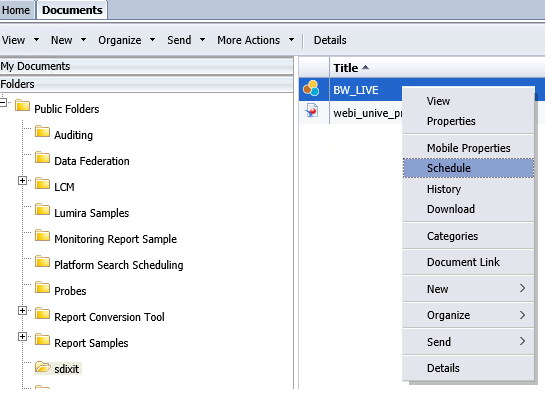 Business Warehouse (BW) Live connectivity in BI launchpad. This blog is intended to provide overview of the “Scheduling Enhancements” done for Lumira 2.1. Scheduling is one of the day to day activities on BI platform and with older versions of Lumira scheduling was supported for offline/imported data sources such as Universe, SAP Business Warehouse and HANA. With Lumira 2.1 following enhancements are done to address various user personas, especially for SAP BW world. Support for Live Document scheduling as PDF. PDF format support for Live and import scenarios. Scheduling support for discovery stories and designer applications. BW process chain event support for scheduling. Support for “Schedule For” option in Central management console (CMC) to support impersonation. 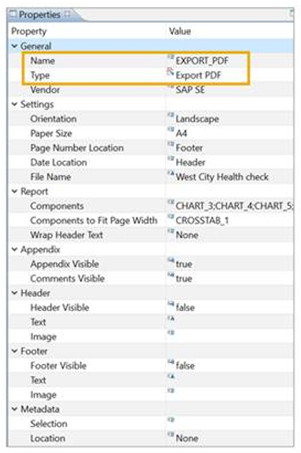 NOTE: This is supported for Lumira documents on the BI platform which is based out of managed connections of type SSO or Pre-defined for HANA and BW live and import. Universes data sources are supported as well. Lumira supports creation of BW and HANA live documents starting from 2.0 version. Such documents when created using managed connections and published to BI platform, they can be scheduled now as PDF documents to various BI platform users. In the schedule screen when you select the option FORMAT, list of stories created in the discovery will be presented and users can chose from the list. Format is always a PDF for Live documents. Fill all other sections by selecting the Recurrence, Destination – select the users (default, email or Inbox destinations), Events and then schedule the document. PDF instance will be available in the selected destinations as well. PDF format selected for the Live in the above case is also available for imported (offline) documents of Lumira as well. this means the Offline document will have 2 options Lumx and PDF for scheduling. The discovery stories created can be taken over to designer and then be enhanced into a designer application OR in a document started from the discovery, a new designer application can be added to enhance it further. So effectively when the document contains discovery stories or the designer applications, one of them can be made as the default application in designer. So such document when scheduled, default application will be considered and corresponding options will be displayed in the schedule screen. 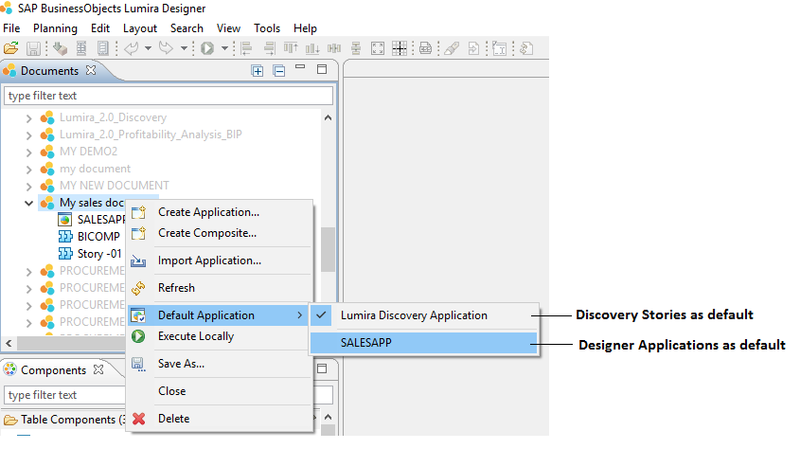 Lumira Discovery Application: discovery stories created in discovery applications. Other Applications: created using the designer application. NOTE: If Offline data sources created in the Discovery and used in the designer applications, schedule would not refresh at the time of scheduling as Designer applications can not refresh offline (imported) data sources. this is planned to be addressed in the near future. Event Delay property must be specified for estimated time in seconds to render the application in headless browser running on server. Pre-requisites: BI Platform 4.2 SP05. With BI platform version 4.2 SP05, we now have a tighter integration with SAP BW systems. Data load events in the BW systems can be used to schedule the documents on the BI platform. 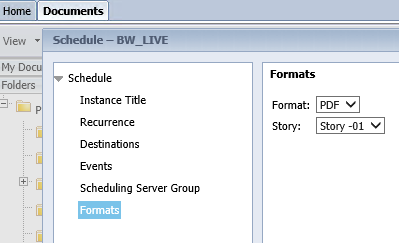 BW events can be created on the BI platform and they can be used at the time of scheduling the Lumira document, which means whenever there is a data load on the BW system, the Lumira document gets scheduled and latest data would reach the intended recepients in the PDF format. If the administrator wants to schedule a document to different users by respecting the data authorizations they have on the data source, “Schedule For” option can be used from the Central Management Console of the BI platform. With this the administrators or users can schedule ob behalf of other users or himself. the recipients will become the owners of the instance and the data in the scheduled instance will be as per the authorizations they have on the data source. Remaining options remain same as that of scheduling from Launchpad. single sign on on the data source would be essential and should be configured on the BI platform to achieve Impersonation when scheduled. Right now its a manual process. we are working on improving this area for 2.2. you might need to wait. So far I can not see option to schedule content refresh in 2.1 discovery Import mode. I have to do this manually everytime. Thanks for the detailed approach, regarding Schedule a LumiraDesigner in BI Launchpad. The problem im having, is that the Schedule fails in BI Launchpad. The error text is”Object failed to run due to an error while processing on the Job Server”. The Lumiraaddon is installed on the BOserver.